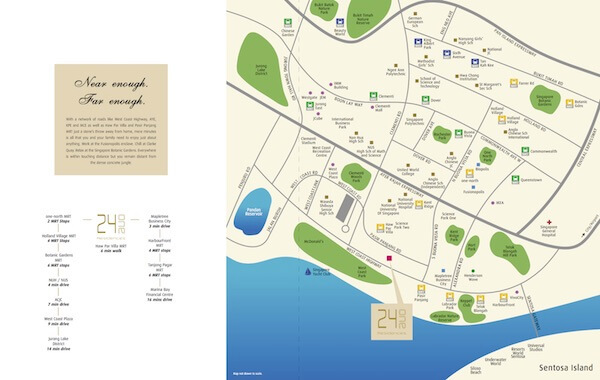 24 One Residences is a Freehold residential development located along Pasir Panjang Road in Singapore District 5. There are lots of amenities around this estate. There are also numerous bus stops in the vicinity for different bus numbers among them being Redwood West, Barossa Gardens, opposite Wharves Building, opposite Redwood West and Buona Vista Gardens. Residents at 24 One Residences will have their shopping and dining needs to be met since there are many shopping malls, supermarkets, and food centers nearby. Shopping malls nearby include Clementi Mall, West Coast Plaza, Ikea, Queensway Shopping Centre, Alexandra Mall, Star Vista and VivoCity. For dining, residents can visit Pasir Panjang Food Centre or Keppel Marina. Supermarkets in the vicinity are NTUC Fairprice on NUH Medical Centre and PSA Branch.